These tool sets and battery packs are very common. Mine were MasterCraft brand purchased from Canadian Tire, but there are many similar ones on the market with other branding. 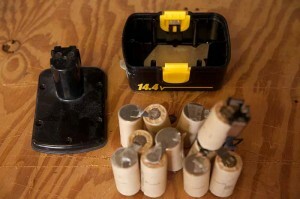 I’d guess millions of similar cordless sets have been sold, so maybe someone else can benefit from this post and save a few $ on new batteries. Perhaps more significantly, maybe this will save some battery packs and even the tools themselves from adding to our garbage output; the Cd in the cells is very toxic, so the less of it we put into use and the less that goes into the waste stream, the better. The following is the procedure that I used. Note that it only applies to Nickel-Cadmium (NiCd) cells, not Li-ion cells. Check the labels on your battery packs about their contents, and don’t proceed if you aren’t sure that you have NiCd cells. As for why this procedure works, please check my note at the end of this post. Usual caveats first: there is risk to property and life and limb in this procedure. You should be familiar with basic electronics and electrical safety practise. Safety glasses are required, just in case the cells leak or something else goes wrong. It’s probably also worth putting a plywood shield or equivalent between the cells and yourself, during the procedure. While I’ve never caused any fireworks with this procedure, better to be safe than sorry. I take no responsibility for what happens if you try this procedure yourself, but I do wish you good luck! 1. Safety glasses. Wear them. I’ve never had an explosion or significant leak during this procedure, but better safe than sorry. 2. A variable DC power supply with adjustable current limiting. Needs to supply at least 1.5A and 2VDC max. I used an old Micronta supply that I’ve had for 30 years. If you lack a current-limited supply, an alternative is to use a voltage supply with a series resistor, but be careful with the power rating of the resistor given the voltages and currents that it might experience. 1. 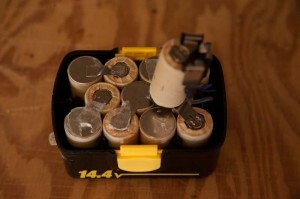 Open up the case of the battery pack and remove the string of NiCd cells. Don’t disconnect the cells from each other; they are probably connected by welded wiring and you won’t be able to reconnect them without special spark welding equipment (don’t try to solder them!). The procedure does not require the cells to be disconnected from each other if they are in a typical series configuration. See the pictures below (pictures coming soon) for assistance, if your battery packs are anything like mine. 2. Work through the following steps one cell at a time. Note that the typical failure mode of these cells results in the cell being in a short circuit condition. This is where the current limiting of the power supply is important. Start with the power supply set to zero voltage and with current limited to about 50mA. Connect a multimeter (or some equivalent device) configured as ammeter in series , and supplying current to one cell. Power supply polarity connection should positive to the positive terminal on the cell, and negative to negative. 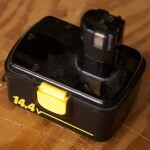 Measure the voltage at the cell terminals with the other meter. Set the voltage limit to 1.5V. 3. Gradually increase the limit current while observing the voltage measured at the cell, until you see the voltage increase rapidly. Wait until the cell voltage exceeds 1.2V, and then disconnect the cell. You should not need to exceed 1.5A current if the cell is actually one that can be recovered. 4. If step 3 succeeds, follow the same procedure with each remaining cell, until all the cells have shown some ability to hold a charge. 5. Reassemble the battery pack, and try charging it with the normal charger that came with the tool set. You should find that it charges normally again. The discussions I’ve seen on the common failure mode of these cells that this procedure works on is that the cells develop shorts between the plates from conducting deposits out of the electrolyte, thus the apparent short circuit state of the failed cells. Once the short exists, it is of course impossible to charge the cell. The high current, which is significantly greater than the normal charging current, serves to obliterate these conducting paths, perhaps by local heating. The procedure I’ve written up above is more controlled than the capacitor discharge method that I’ve seen elsewhere in that the current is raised in a controlled fashion only until the short is removed. The above procedure could be less risky than the capacitor discharge method as a result, although you should be careful to remove the power supply current as soon as the voltage rises. YMMV, but my success rate on my small sample size of 3 battery packs (about 30 cells) stands at 100%. Thank you for this extremely useful blog. I appreciate you sharing this.Really looking forward to read more. I happened to come this site and noticed your power supply,do you still have it?Please e-mail me back. Yes. I still have that power supply. It’s one of the core instruments on my workbench and gets used a lot. Sure. You can ask any questions here on the blog, and I’ll do my best to answer. If I can’t answer, maybe someone else reading the blog can. Great article and I’ll keep it handy ’cause I have power packs two and that senerio might happen. Now to my question(s) relating to the Micronta. If so what year was it made?American or Canadian Radio Shack store? it looks something from the ’70′s early 80′s, might be wrong? inside of the Micronta variable power supply there’s a 14 pin chip,can you provide me what’s written on it.Now for the voltage adjustment pot what is written on and what is the value? 1. Yes, the supply is indeed model 22-8230, and was from a Canadian store. The store was of the ones I worked at in Sault Ste. Marie. I actually recall paying something like $29.95 for it on sale, although that was a very long time ago. 2. The IC looks to be MC1723CP, date code 7744 (consistent with late 1970′s date of manufacture). Googling on MC1723CP shows it to be a voltage regulator, so that seems right. 3. The voltage adjustment potentiometer looks to be a 10K linear pot based on an in-circuit measurement, but I can’t be certain of that from any markings on it. I’d have to do some desoldering and measure it out of circuit to be sure. Let me know if that is critical information for you; if so, I can look deeper. Hope that helps. Please ask in case of any other questions. Thanks alot for your trouble.That’s why I couldn’t find it in the American catalogs. The reason I’ve asked for the chip is that for some reason mine is hardly visible(scratched for some reason,bought the Micronta power supply second hand)it’s a Sanyo from it’s logo that’s all I can see.Yes I agree with you,voltage regulator.On the pot for current adjustment there’s some writting on it it might be the same for the pot for voltage(mine is missing that’s why I’ve asked for the value).I don’t want you waste your time to take the voltage pot appart,it’s up to you.It would be nice to know the value but you’ve helped me alot with the info. Sorry to ask you something again the manual for that(I know it’s straight foward,but it helps)do you recall if even there was one or just a page? Back to the subject I’m glad I came across your site and appreciate your help. Glad to be of any help. I just checked that pot out of circuit: It’s actually 18.6K ohms, so probably a nominal 20K, and it’s linear. I looked for the manual, but sorry, don’t have it. I actually did find a few old Radio Shack manuals in my files but not that one! Very funny re that tester, too. I think I got mine in similar way, from Canadian Tire. BTW when I’ve mentioned American Radio Shack catalogues if found them on the net.As for Canadian no luck yet. I’ll be back in the Sault in a few weeks visiting family there. I’ll check to see if I still have any of the old Radio Shack catalogues there. Slim chance they are still around, but I used to keep them. Thanks that the site I was mentioning in March although no Canadian cat unless I haven’t checked well. Hi I got Schematic Diagram for the Power Supply Micranta # 22-8230 & Part List if poeple needs it. this 1.4amp limit is for small D Nicadsand Nimh types, right? on larger or smaller ones (AA) I guess the “busting current is smaller….any experience with these? why cant i solder in a “winged” battery? very carefully spot solder without cooking the battery of course…. Thanks. Those were roughly C-size NiCd, but yes, I’d expect required current to vary like you suggest. Hard to know how much current will be required for any case, so monitoring voltage is helpful to see if short disappears. Soldering OK if v careful with heat, but you might find the case/tab metal to not take solder well without very corrosive flux. Spark welding might work -haven’t tried that. Hi Dave, Yes it would be all right to do it, but tell him that I have trouble with my program Live Messenger so it may take a while to get back to that person. My program Live Messenger fail to open, it tell me that it fail Key Ports and won`t let me in. I got to go by Live Messenger Program itself. Robert Have a good day. Thanks for the info. I started out with two 10.7 volt battery packs for my cordless drill which I was not able to recharge using the charger that came with the drill set. After reading your blog I decided to give it a try, but I did not have any special tools, etc. So I used a small charger which I bought for charging AA and AAA batteries and began charging the entire pack of 7-cells. I assumed it would charge at a very low current, but it was all a guessing game for me. I was not able to adjust or monitor the voltage or current during that time. 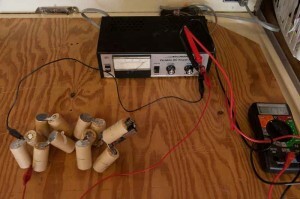 After two hours, I disconnected the low voltage charger and began charging the battery pack with my 12-volt auto battery charger. It started out charging at about 1-amp and gradually increased until it was charging at about 5-6 amps. The battery pack became very warm, so I disconnected it and let it cool down for an hour or so. Then I used charger that came with my drill set which is a 10.7 volt charger. All went well and after a few hours my battery pack was working again. This was a real lifesaver for me because the manufacturer of my drill was not making replacement battery packs for my drill set anymore and I would have had to buy a new drill set. Lester, glad that my post was any help to you, and especially that you got your battery pack working so that you could keep the drill set. Well done. Sometimes, when battery packs fail and can’t be rejuvenated, you can take them apart and replace the cells inside, but no need to in this case.